This page is full of clips, links, shackles, and swivels for the many different specialty connections a tree climber needs to make. We stock twisted clevises and locking twisted clevises which can be used to attach a mechanical flipline adjuster to your saddle, swivel shackles which can be used to let the connecting hardware turn freely, and a variety of links, snaps, and quick links which are ideal for attaching tools, bags, and other gear. The shackles and links on this page are intended for static loading only and not for shock loading. Lightweight, small-profile aluminum hook. Borrowed from rock climbing, this hook is finding use as a connector for tending your hybrid system. Anodized aluminum, weighs 14g / .5 oz. Colors may vary. Brass plated swivel snaps are available in three sizes. Great for a variety of uses, including attaching saw lanyards, tool bags, and use in split tail systems. Light duty only. The Quickie is a locking steel connection developed by Kevin Bingham, the inventor of the Rope Wrench. The Quickie is super-compact, and can be used for many applications where a quick, locking connector is needed. Excellent for use on a basal anchor. IMPORTANT NOTE: When using the Quickie in a cinched configuration make sure the slic pin is facing away from the tree or object being girthed around. The Quickie pin is not compatible with other Singing Tree devices. High-quality, galvanized steel quick link made from 1/4" stock, with a manufacturer WLL of 880 lb. Made in France. Strengths listed above are tensile strengths. WLL for 1/4" is 1,200 lb WLL for 5/16" is 1,760 lb WLL for 3/8" is 2,700 lb 1/4" link has a 5/16" opening; 5/16" link has a 3/8" opening; 3/8" link has a 1/2" opening. Quick links have lots of uses, from attaching ascender slings to making your own custom set ups. Strengths listed are Working Load Limits and are calculated at 20% of breaking strength. 1/4" link has a 5/16" opening; 5/16" link has a 3/8" opening; 3/8" link has a 1/2" opening. Strengths listed are tensile strengths. 1/4" link has a 5/16" opening; 5/16" link has a 3/8" opening; 3/8" link has a 1/2" opening. Made in France. Galvanized steel quick link with oval shape, twisted 90 degrees. The particular twisted shape allow operation at right angles. Stainless steel pear shackles from Maillon Rapide. Made in France. 3/8” - 13/16” opening - 1,850 lb WLL. Galvanized steel pear shackles from Maillon Rapide. Made in France. 5/16” - 3/4” opening - 1,058 WLL. 3/8” - 13/16” opening - 1,320 lb WLL. Twisted, steel link from Maillon Rapide. 90° turn over the length of the link is perfect for when you need one element to connect to another at this angle. Must be secured tightly before use. Made in France. 5/8" opening, 4" overall, 32 kN (7,193 lb) along main axis, 10 kN (2,225 lb) on side axis. Strengths listed are tensile strengths. A great upgrade to the twisted clevises listed below, these forged-steel twisted clevises screw tight into a "locked" position to ensure your connection is extra secure. Often used to connect to a flipline adjuster, as the twist holds the adjuster in a horizontal position that is easier to adjust. Must be securely tightened before use. Made in France. Stainless steel locking D shackle from Wichard. 5/32» bar stock, 5/16” opening. 700 lb working load limit. Made in France. Stainless steel locking D shackle. 3/16» bar stock, 7/16” opening. 440 lb working load limit. Made in China. Keypin locking shackle has a 1/4" shackle pin diameter and a 3/4" inside width. 4,620 lb. maximum break strength. 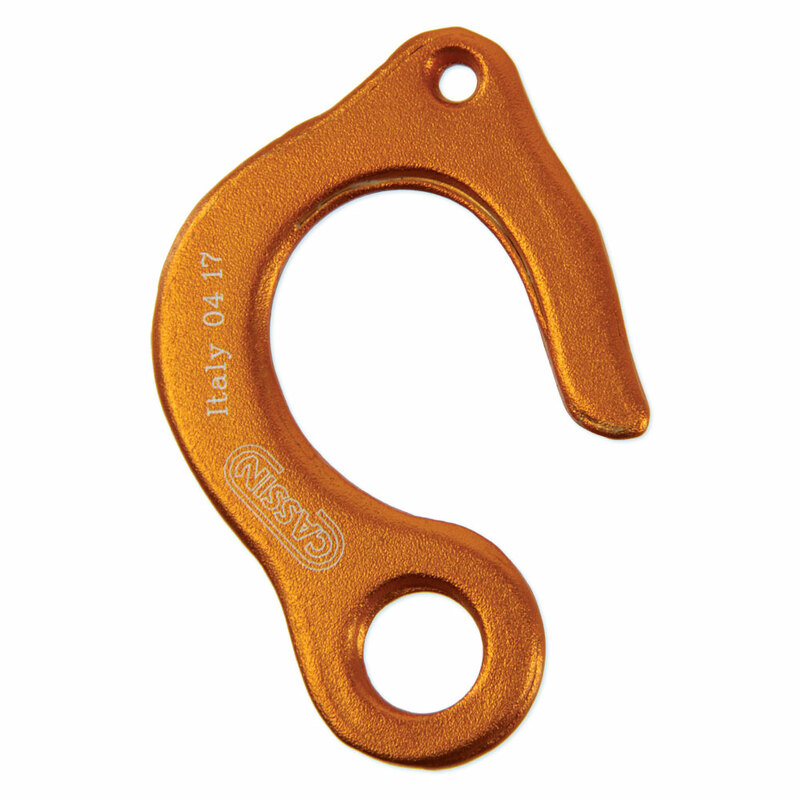 Soft Shackle provides a flexible, strong, durable link for attaching rigging tools. Made from high-strength Dyneema. 8mm (5/16”): MBS 12,900 lb. 10mm (3/8”): MBS 15,500 lb. Stainless steel shackle with built-in pulley turning on a bushing. Features: 2 1/2” x 1 5/8” , weighs 2.5 oz., 8,000 lb. max. breaking strength, 1/2” capacity. CM galvanized steel shackle. CE certified. Made in the USA. 3/4” bar stock. 9,500 lb WLL. 7/8” bar stock. 13,000 lb WLL. High-quality US steel rigging rings. See our crane slings with ring. CMI's 5/8" arborist shackles is machined to accept a custom built slic pin which cannot be lost at height. Zinc-plated to prevent rust, with a working load limit of 3 1/4 ton (6,500 lb). Stainless steel shackles are available in four sizes and secure with a screw pin. Galvanized steel shackles with a screw pin.